Product prices and availability are accurate as of 2019-04-19 20:01:41 EDT and are subject to change. Any price and availability information displayed on http://www.amazon.com/ at the time of purchase will apply to the purchase of this product. 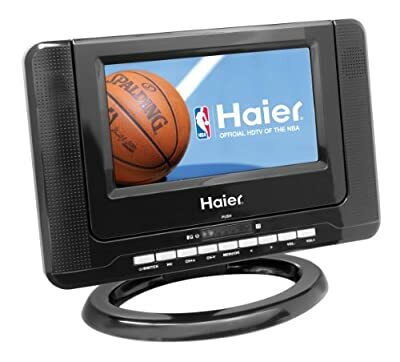 The Haier HLTD7 portable LCD TV and DVD combo gives you the ability to enjoy your favorite television programs anywhere, any time--in your home or away. Watch the morning news without having to get out of bed, or while sun bathing in the back yard. Does someone else have dibs on the TV room? Pull out your HLTD7, and you've got your own TV room. This handy little portable TV has a 7-inch LCD screen that switches between a 16:9 and 4:3 aspect ratio. It has a built-in ATSC/NTSC tuner enabling you to receive crisp reception of your favorite channels - even after the digital-to-analog switch in June 2009. Nothing on TV? Watch your favorite movie with the front-loading DVD player. The HLTD7 connects to other devices with an audio/video input/output jacks and coaxial output. Watch with others using the built-in twin speaker system or plug your headphones into the included jack to enjoy your favorite programs without disturbing those around you. The rechargeable battery offers up to 2.5-hours of life between charges -- enough time to watch an entire movie or several episodes of your favorite show without a recharge. 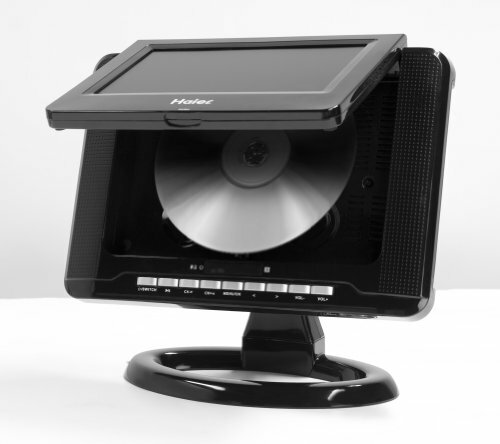 With the help of the built-in stand you can conveniently set the TV on any table, desk or counter. The HLTD7 includes an AC power adapter, a car adapter and a remote control. Note: Reception of over the air signal depends on your location. Lack of reception does not indicate a defective product, but merely a weak transmission signal. Try moving the unit to another location, or connecting to cable, satellite, external or an indoor antenna.